NOTE: Minimum Age Requirement Strictly enforced. Copy of driver's license must be emailed within 24 hours of booking or reservation will be canceled. Close To The Beach! : The condo is very close to the beach - only fifty steps from the building and you'll have your toes in the sand! There are no streets to cross to get the the beach. The 41st St. beach area has lifeguard and beach gear service. Cozy Home Away From Home: The condo has everything you need for a nice beach get-a-way. The full kitchen includes: refrigerator, stove/oven, dishwasher, microwave, coffee maker, blender, toaster, dinnerware, flatware, glassware, cocktailware and cookware. The bedroom area has a queen sized bed and three drawer dresser, nightstand and alarm clock radio. The living area has a queen sleeper sofa, coffee table, flat screen television with basic cable and a DVD player. It also has a bistro dinette set for two with bench for additional seating. The updated full bath has combo shower/tub and lots of storage. Other amenities include stackable washer/dryer, CD/radio, books for adults/kids, DVDs, kids toys, board games, puzzles and umbrella stroller. There is a private balcony and private covered parking (low clearance approx 6') . There is also a private ground level storage unit that you do NOT share with other tenants/renters in the building. It's great to store your bikes, kayaks, beach gear, suitcases, etc. Bed linens, bath and beach towels, and kitchen towels are available for guest. Guest is responsible for laundering the items used prior to departure. The condo complex has an outdoor shower and guests will have access to our private locked storage on the ground level near the showers to store your beach gear. No need to lug gear up to the condo. We stock the beginning of the season with beach chairs, beach umbrella, cooler, frisbee, football, sand toys, fishing rod spike and a beach cart to bring your items to the beach. If guests provide proper care of these items, they should be available for use all summer. Lots To Do In Walking Distance: 41st St. and Coastal Hwy, you'll find the convention center, Dough Roller, and Ritas. A nice stroll to the boardwalk which begins on 28th St.; Jolly Rogers Amusement Park is on 30th St.; Seacret's Night Club is on 49th St; Lots of restaurants and shops in the area. Close to grocery stores. Convenient coastal highway bus service to go out and about town with bus stop on corner. Perfect vacation spot for all ages - close to it all but yet away from it all. No high rises in area and mostly private condos so typically a quiet area and plenty of space on the beach. Surrounding area attractions (by car): Assateague Island; Rehoboth Beach, DE factory outlets; Frontier Town, Lewes Ferry to Cape May, NJ; OC Factory Outlets; golf courses; Ocean Downs Casino. NOTE: You must be 22 years old to rent with us - No exceptions. Copy of driver's license must be emailed within 24 hours of booking or reservation will be canceled. NO pets; NO smoking. Our property is registered with the Town of Ocean City as a rental property. License #11-00019369. About Sharon & Kevin We bought this condo to have an inviting reasonably priced place for guests to stay during their visit to Ocean City, Maryland. 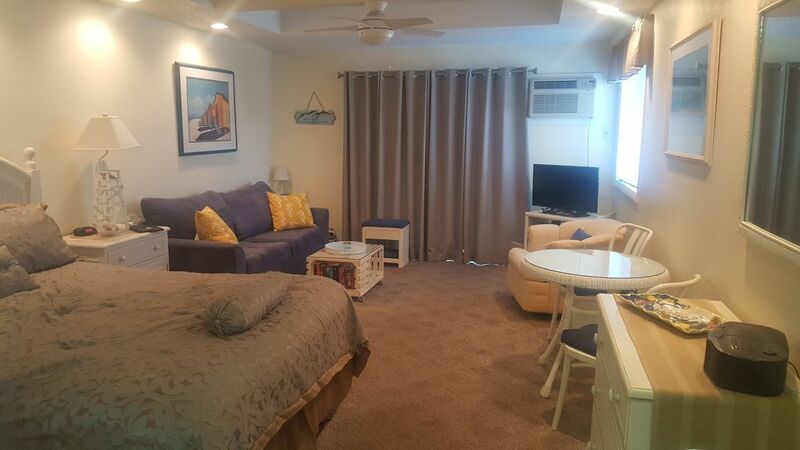 However, this condo is more than just a rental unit, it is also our beach home where we will spend time with our family and friends making beach memories. We hope you'll find that you make many beautiful memories during your stay, as well. We strive to quickly respond to inquiries and answer any questions you have as you finalize your vacation plans. Planning a vacation can be a big decision and quite an undertaking. With this in mind, we are here to help make your plans and the rental process as easy as possible. Our condo is in a great location in mid-town Ocean City so it's easily accessible to many of the favorite hot-spots. Yet, it is in a very quiet location where there are no hotels/motels or high rise buildings. What does this mean for you? Less people and a quiet and relaxing get-away awaits you! The beach is just steps away and the beach is not packed with people - even in the peak of summer. When we go on vacation, we like to rent a place that has everything we need so we have less to pack and less to purchase when we arrive. This is the mindset we have when offering our condo for your vacation. As you read the descriptions and reviews, you'll see we really do try to stock all those incidentals and accessories.... whether it's in the kitchen or for the beach you should have most of what you need at your fingertips. We spend a lot of time off season making changes and enhancements to the condo to continue to provide our guests a pleasing vacation get-a-way. We have many guests that return year after year - certainly speaks to a positive vacation experience that they want to stay in our condo again! When renting private homes, keep it mind it is a 'stay-it-forward' system. It is important that you leave the condo super nice for the next guest. Very close to beach All the amenities you need, so little to pack! Quiet area despite being a busy beach resort You work directly with the condo owners - we care about your stay! The bathroom has a tub with shower. There is a lot of storage over the toilet, in the vanity and medicine cabinet. We do stock with hair dryer, night light, band-aids, peroxide, toilet paper, and small toiletries should you forget something. Bathroom linens and beach towels are also available for use, but must be laundered by guest before departure. We are just steps to the beach... no roads to cross. We are just steps to the ocean... no roads to cross. In wall unit with auto temperature control and a remote control. It is suggested guests bring own linens. Queen bed sheets are available for guest use. However, guests are responsible for washing/drying & putting away items used prior to departure. Condo sized stackable washer/dryer is in the unit. Laundry detergent is stocked at the beginning of the season. Condo sized stackable washer/dryer is in the unit. Dryer sheets are stocked at the beginning of the season. Complimentary private wi-fi service is provided to our guests. It is suggested guests bring own linens. Bathroom, kitchen, beach towels are available for guest use. However, guests are responsible for washing/drying & putting away items used prior to departure. There is a living area with full size sofa, rocker chair, coffee table, TV and lots of sunshine. Full-size dishwasher. Dishwashing detergent is stocked at the beginning of the season. Full-size refrigerator/freezer with ice trays. 12 cup coffee maker with timer. Coffee filters are stocked at the beginning of the season. Pam, sugar, sweet 'n low, salt & pepper, foil, saran wrap, and coffee filters are stocked at the beginning of the season. Baker's rack in kitchen to store your grocery items. Fully stocked with dishes, glasses and utensils for adults. Kids friendly dishes and cups are also stocked. Fully equipped kitchen. Paper towels and dish detergents are stocked at the beginning of the season. Dinnette set for two with bench for extra seating if needed. Private balcony with 2 Adirondack chairs with cushions and two side tables. There are beach chairs, boogie boards, sports gear, and lots of sand toys available for use. A beach cart is available, as well. We try to stock the unit with everything you will need besides food, beverage, clothing and personal toiletries so that you can worry less about forgetting something and focus on getting ready to have fun in the sun! We are glad you feel our condo was nice for the price. Thank you, as well, for the very nice review written in our guest book in the condo. We're also glad we were able to quickly retrieve the item left behind and have it shipped back to you! Very clean, convenient location, just as described. Would definitely stay here again. We are so glad you enjoyed our condo and it's proximity to so much. We do try to clearly represent our condo in our listing so our guests are pleased. We hope to have to you stay again and, remember, returning guests get a 10% discount! A spot for the family !! Wow ! We were completly in LOVE with this rental. With having two small children taking vacations is rough. But staying here definetly took a huge off our shoulders. We loved the stay it forward concept ! We enjoyed the peacful quiet location (there was no loud noise to disturb our sleeping children). Our favorite part was seeing all the detail and efforts Sharon and Kevin put into their rental , everything was labled , organized , clean. As a mom (whos always worrying) I felt really at ease being there just because they made things so easy. Thank you so much Sharon amd Kevin you two are great rental owners ! We look forward to coming back in the future ! P.s the books with notes from your guests was darling ! Loved seeing all the positive tid bits ! Jacklynn- we are so glad you were pleased with our condo and all the thought and detail we put into our condo to make it a pleasant stay for our guests....even down to outlet covers to help keep little ones safe. Our goal is always to provide a clean updated condo with lots of amenities for inside the condo and for on the beach. If you return to OC again, remember we do offer returning guests a discount! It was exactly what we needed for the weekend. They had everything we could want from beach stuff to kitchen ware. Tyler we are so glad you enjoyed your stay at our condo for your weekend get-a-way! We do try to stock the condo with everything you might need in the condo and for the beach. We are glad to hear we had everything you might need. Have a great rest of the summer! We enjoyed our stay, especially appreciating the short walk to the beach, having all the beach equipment we needed in a handy storage unit, and a thoughtfully stocked living area. It was nicely decorated which added to the charm. Information sent prior to our trip was thorough and helped us know what to expect. We somehow hadn't realized it was an efficiency (not a 1-bedroom) and found it a little too cozy for 4 adult women, but seems like it would be perfect for a couple with smaller children. And it was just fine for us for 2 nights. Oh no Martha! We are so sorry you were anticipating a separate bedroom. We'll definitely review our photos, etc. to see if we can make it clearer. Despite the extra coziness, we are glad you all enjoyed the condo, amenities and information we provide to guests as they plan for arrival and location. We hope you had fun ringing in your birthday! Perfect place In perfect location! This was our second year staying here. It’s like a home away for home. Very comfortable. We’ll probably be back next year. Linda we are so glad you enjoyed your stay with us again this year! We are very lucky to have guests who stay with us year after year. Hope to see you next year! WE ARE UNABLE TO RENT TO HIGH SCHOOL SENIORS. See requirements below. This lovely 41st St. ocean side condo is just fifty steps from the building to the beach -- no streets to cross! An easy stroll to the convention center (just across Coastal Hwy), Seacrets, Jolly Rogers, boardwalk (starts on 28th St) and restaurants – something nearby for everyone to do! The condo is well appointed with queen size bed; living area with queen sleeper sofa; color TV with cable/DVD player, CD/radio; dining area; fully equipped kitchen with refrigerator, stove, dishwasher, microwave, blender, coffee maker, toaster, dinner/silver/cookware; full bath; stacked washer/dryer; balcony; assigned covered parking. We stock the condo at beginning of season with paper products, detergents, etc. Baby/Toddler gear - umbrella stroller. Ground level condo building shared outdoor shower and use of private locked storage unit with beach chairs, umbrella, and sand toys – just grab and go! MUST be 22 to sign lease and be staying on premises. We are unable to rent to high school seniors, even if parents are willing to sign. NO exceptions. NO pets; NO smoking. Responsible guest making reservation must be at least 22 years old. Taxes will be added 4.5% local/occupancy and 6% state taxes. 10% discount offered to returning guests, as well as for active military and first responders (police, firefighters, paramedics). Proper ID validation required. Our rates do NOT include the separate service fee assessed by Homeaway/VRBO for booking through their on-line portal.